The Madeleine is a Napoleonic structure on the classical temple model which was built for the emperor as yet another monument to the victory of his army. 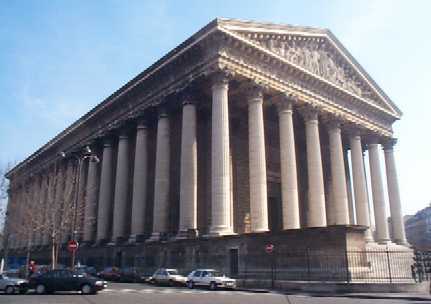 The building is a windowless Church with a Greek temple facade of Corinthian columns 20 metres high. Work on the church was begun in I764. At the east end of the interior a series of frescoes celebrates heroes of Christianity in a span which includes, surprisingly, Napoleon. On the east side the Madeleine there is a flower market every day except Monday.